Now that you can stream your favorite boutique fitness class in your bedroom and get every nutritious food imaginable delivered on the reg, being a healthy homebody is easier than ever. But there’s a new star on the stay-in wellness scene: the at-home health test, which lets you suss out what’s happening in your body at the molecular level without ever kicking off your slippers. 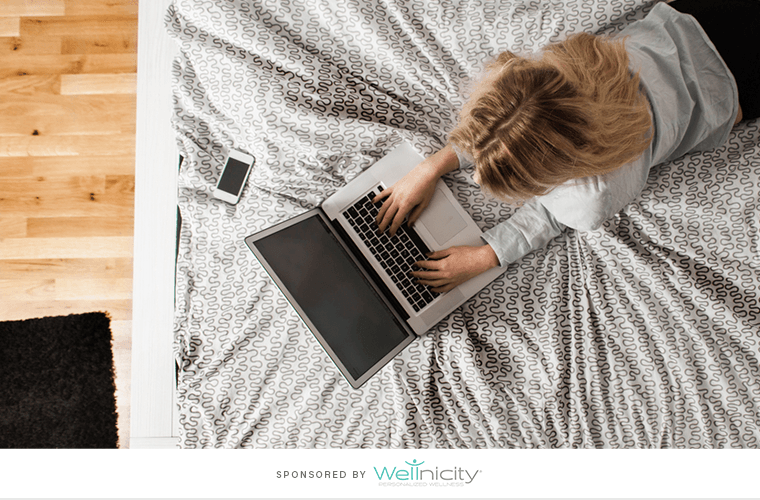 Wellnicity®, the personalized wellness brand, is on the frontline of the at-home testing trend. And it’s insanely easy: You start with a general quiz that points you to the specific test most likely to uncover underlying issues making you feel…blah. Then it’s just a matter of dropping a sample in the mail (think urine or saliva) and waiting for results. The company’s hope is to make personalized wellness as easy and accessible as ordering takeout. Plus, tests are processed at independent certified labs (so you get trustworthy feedback), and expert clinician guidance is included every step of the way, from submitting your test to reviewing results and choosing which Wellnicity® professional-grade supplements are right for you. Here are five wellness areas—from brain chemistry to gut health—you can now test for in your jammies. Neurotransmitters are chemical messengers that can affect just about everything in your body, particularly when they’re out of whack. Wellnicity®’s Brain Balance Test screens for seven important ones, like serotonin (which affects a whole host of factors, including mood) and dopamine (which helps control the brain’s pleasure and rewards centers). It’s the company’s most popular test, Helmly says, largely because brain chemistry testing is rare to find and can offer such valuable insight into common mental health issues like anxiety, depression, and sleep problems. “[It’s] nice to have an assay that allows us to quantify why we feel so bad,” she says. Bloating and digestive discomfort are ridiculously common, but figuring out what gives can be a months-long guessing game. Many people have jumped on the anti-gluten bandwagon only to find out it’s actually, say, nightshades that are making them feel painfully bloated. Wellnicity®’s 180 Food Sensitivities Test lets users screen up to (you guessed it!) 180 different foods with a quickie finger-prick blood test that checks for Immunoglobulin G, the most abundant type of antibody in the body. Its presence suggests an inflammatory reaction has occurred—a good indicator that a particular food is the culprit. The gut is clutch when it comes to digestive health…and brain health…and inflammation, and yet it’s not like it’s simple to suss out what’s going on in your small intestine. Heck, most people probably don’t even know where the thyroid is or what it does. And yet the gland—which is a part of the endocrine system—controls all of the body’s metabolic processes. When the thyroid’s imbalanced, it can lead to a huge range of symptoms, from low body temperature and dry skin to sudden weight loss or gain, depending on whether it’s under-active or doing way too much. “Fatigue, lack of lean muscle mass, and of course slow digestion [and] constipation can all be caused by endocrine imbalances,” Helmly says. Wellnicity®’s Thyroid Test screens for three different types of thyroid hormones to get a robust picture of how well your thyroid is humming along. There’s normal stress and then there’s chronic stress—the kind that puts your body in perpetual fight-or-flight mode. Being in that high-alert, always-on state can lead to feelings of fatigue, sleep problems, poor focus, and just feeling really overwhelmed. Wellnicity®’s Stress Test gives a clearer picture on how well the body’s coping with all your physical and emotional demands by measuring levels of cortisol (the body’s primary stress hormone) and DHEA (another hormone that’s increased by acute stress). And with a clearer picture, you can figure out a supplement plan, tap mindfulness rituals, and basically figure out how to deal. Stress, busted.